Rev Fran: "Like Sheep Without a Shepherd." A Sermon from Littlefield Presbyterian Church. "Like Sheep Without a Shepherd." A Sermon from Littlefield Presbyterian Church. "Like Sheep Without a Shepherd"
The shepherd is a common ancient metaphor for leaders, and for kings in particular. Jeremiah shares with the prophet Ezekiel the conviction that leaders bear more responsibility than their people for social justice. There’s a persistent ethical theme throughout the Hebrew Bible. God requires the community to be ruled with justice and righteousness, which is to be made manifest in how they treat the alien, the orphan, and the widow. But, as Elaine James suggests, rulers who seek their own fortune, who expand their houses and enrich their coffers at the expense of the poor are in egregious violation of God’s covenant, and will be held accountable. The prophet speaks with tenderness and compassion on behalf of the people. Judah’s political leaders have been corrupt and have failed the people, but God is the shepherd who will ultimately redeem the people. In Psalm 23, which we heard earlier, we hear similar images of a divine shepherd who is a source of comfort and life. In the scriptures, we hear assurances that, while corrupt leadership has “scattered” the sheep, God will “gather the remnant of my flock.” God will act as the good shepherd, as a model of just rule and care. Jesus is described in these terms in the passage we heard today from Mark’s gospel. 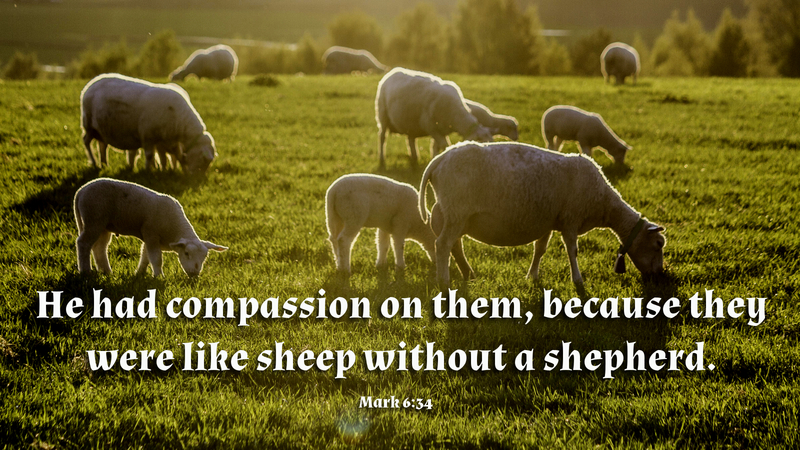 Jesus sees that the crowd of people are “like sheep without a shepherd,” and has compassion on them. The imagery of shepherds and flocks of sheep would have been well-known to people in ancient times. The shepherd--and by analogy the king-- is responsible for the well-being of the sheep: to feed them, protect them, guide them. But the opening verses of Jeremiah 23 accuse the shepherds of destroying and scattering God’s sheep. The kings have not been good shepherds. The sheep are in exile, scattered among the nations. God’s anger is aroused by the “evil doings” of the descendants of King David who ruled Judah, who probably included Jehoahaz, Jehoiakim, Jehoiachin, and Zedekiah. Jeremiah prophesied in the final years of the Kingdom of Judah, through the reign of the last king, Zedekiah. These were turbulent times for the leaders of ancient Judah. The seats of power in the ancient Near East had shifted. The Assyrian imperial dominance of the past hundred years was waning, and the Babylonian empire was on the rise. This international upheaval left the kings in the little nation of Judah with some very difficult decisions. Would they pay taxes to the new empire in Babylon, or should they side with their neighbor Egypt? Could they be independent and refuse to pay tribute to either one? It turns out that the decision to withhold tribute--against Jeremiah’s advice-- would not end well. The shepherds of Judah made policy decisions that placed the people in jeopardy and ultimately led to their exile. As biblical scholar Elna Solvang points out, while Zedekiah’s name means “my righteousness is the LORD,” his reign was far from righteous. As I worked with the passage from Jeremiah for today, I realized I needed a bit of a refresher course on the context, so I could interpret the passage accurately. In my Introduction to the Old Testament class at Princeton Seminary, we were required to memorize the names and order of the kings of the kingdoms of Judah and Israel and the prophets who prophesied in each of those times. But that was a long time ago. As I did some reading, it occurred to me that all this background might sound pretty political to a lot of people. It sounds political-- because it is political. Jeremiah was prophesying in response to what was going on, and he was bringing a word of judgment from God to the political leaders of his time. Jeremiah’s prophecy is rooted in a challenge to corrupt and ineffectual government over the people, a critique of the “shepherds” who have destroyed and scattered God’s sheep. After pronouncing judgment on the evil shepherds, God promises to shepherd God’s people Godself and then to raise up shepherds over them. In this promise, we hear hope for peace, security, and prosperity, all of which are rooted in the faithfulness of God. Jeremiah’s prophecy offers a vision of God’s breaking into human history, but it is clear that we aren’t yet living in the state of shalom for which we long, where justice and peace rule. The prophecy points us to the “already” and the “not-yet” of God’s work among us. The gospels tell us that the people in Jesus’ day had been hoping for a Messiah who would come with armies and rule with might… a Messiah who would provide for peace through war and by defeating their worldly enemies. But Jesus showed us that God shepherds and protects God’s people not through violence, but by offering God’s very self, and by teaching us to love even our enemies. Jesus revolutionizes our understanding of what God’s promise of security and prosperity mean in the kin-dom of God. Governments are true to God’s purposes only when they rule in congruence with Christ’s self-giving and understanding of love that is at the heart of the gospel. So, how do we live in response to the hope we have been promised? How do we live into the new life God desires for us? 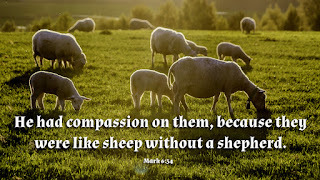 Some of us may feel “like sheep without a shepherd.” Will there be shepherds for us who are different from former shepherds?-- shepherds who will choose to be good shepherds, who will attend to the justice, protection, mercy, and righteousness that mirror God’s shepherding? Just as the people of Judah could respond to bad shepherding by being cynical about their leaders, we too might be struggling with cynicism. We look around and we remember that children in Flint have had their lives and their potential forever changed due to lead in the water… that thousands of poor families in Detroit are living without running water… that many people in Puerto Rico live without electrical power. We see images of children separated from their families at our southern border. We worry about the stripping of the social safety net while the wealthiest get tax breaks. In Paul's letter to the church at Corinth, he tells them that, from now on... we regard no one from a human point of view.... if anyone is in Christ, there is a new creation...from God, who reconciled us to himself through Christ and has given us the ministry of reconciliation. In Christ, God was reconciling the world to Godself and entrusting the message of reconciliation to us. That ministry of reconciliation is still our calling. For Christ is our peace. In his flesh, he has made both groups into one and has broken down the dividing wall of hostility between us. Christ came proclaiming peace to those who were far off and peace to those who were near.... No one is to be a stranger or alien, but citizens with the saints and also members of the household of God.... joined together and growing into a holy temple in the Lord... built together spiritually into a dwelling place for God. In the passage from the letter to the Ephesians, we see a glimpse of the new community: So then you are no longer strangers and aliens, but you are citizens with the saints and also members of the household of God, built upon the foundation of the apostles and prophets, with Christ Jesus himself as the cornerstone. In a time when we hear a lot of talk about building barriers along our nation’s southern border to prevent illegal immigrants from entering, a time when Israelis have built a wall to separate themselves from the Palestinians, and other territories are protected by barriers and demilitarized zones to keep enemies apart. Now, eliminating boundaries doesn’t in itself create peace. Peace comes by eliminating the hostility behind the dividing walls. God doesn’t just tear down walls, but unites people in the One who is our peace, creating one new humanity. Some of us are old enough to remember the day the Berlin Wall came down. Most of us never expected it to happen in our lifetimes, and the feelings of surprise and possibility were palpable. If this wall could fall, what else? The end of apartheid in South Africa brought even more hope and excitement. The divisions of black, white, and colored of the Apartheid system were coming apart, and reconciliation became possible. Archbishop Desmond Tutu of South Africa said he believes that God’s hand was in that miracle. In the midst of all the brokenness and fearfulness and busy-ness and weariness and cynicism and hopelessness in our world, our Shepherd God keeps calling us into beloved, Sabbath community, where we can be fed and find rest, a community where we can encourage, console and celebrate with each other, renew our vision… and remind one another that we were put in this world for Gods good purposes. Ezekiel uses this same metaphor to speak of the exile of Judah in Babylon in Ezekiel 34. Jeremiah 22:11-12, Jeremiah 22:18, Jeremiah 22:24-30, Jeremiah 21:3-7.